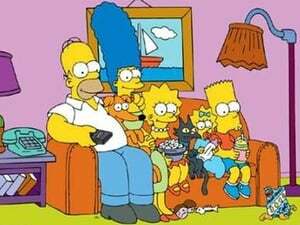 Good Night was the first ever Simpsons short to air on The Tracey Ullman Show. 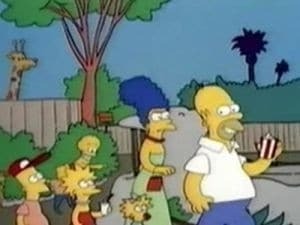 The five main family members - Homer, Marge, Bart, Lisa, and Maggie - were first introduced in this short. 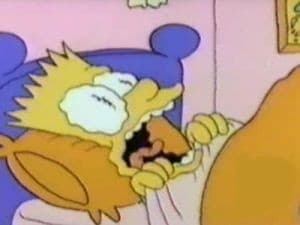 Homer and Marge attempt to calm their children to sleep, with the opposite results. Maggie can be heard saying "good night". She rarely talks throughout the run of the series. 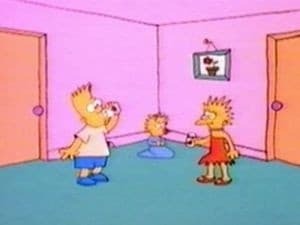 Bart and Lisa quarrel during commercial breaks over what channel they'll watch. Repeatedly Maggie comes up to the television and changes the channel. Later Homer is saying some speech about family matters then stops when the show comes back on. 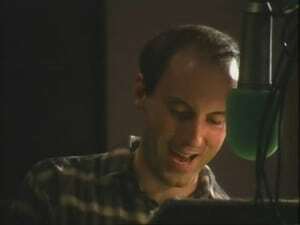 A piece of music from the Tracey Ullman show plays at one part or another during the short. 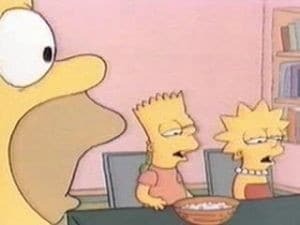 Marge puts Bart and Lisa in charge of babysitting Maggie. They watch TV while Maggie gets electrocuted, falls down the stairs, and falls off the roof. Maggie sticks a fork in an electrical socket thereby electocuting herself, she crawls up the stairs and falls down them in insane Slinky fashion then she climbs onto the roof in hot pursuit of a butterfly, and falls off it. 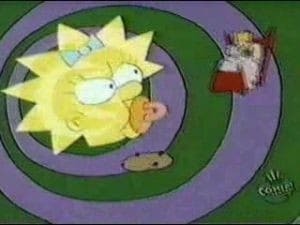 Lisa and Bart try to get Maggie to stop sucking on her pacifier, but Maggie, who has an entire drawer full of them, refuses to kick the habit. 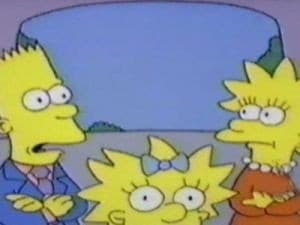 Despite Marge's objections, Bart, Lisa and even Maggie compete in a contest to see who can make the most disgusting burp. Marge serves the family purple goop for dinner, insisting that they say grace first. 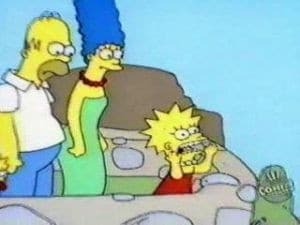 Despite Marge's warnings, the kids make faces. 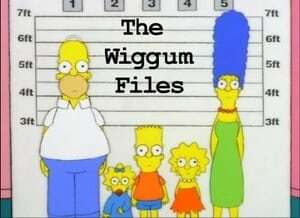 Maggie unclearly speaks in this episode. Bart is determined to see his uncle's corpse...but not for long. This is the only appearance of Uncle Hubert. Bart and Lisa wonder what's inside Maggie's mind. Homer teaches Bart about the importance of Football. Bart tries to make a house of cards, but Lisa Maggie make noises that have the "house" fall every time. Bart can't stomach it when he and Homer are forced to fend for themselves. Bart, Lisa and Maggie play a game of "Space Patrol" while Homer and Marge are out. 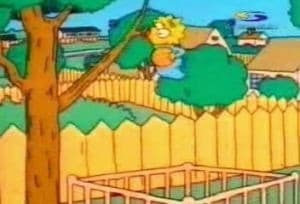 Lisa plays a superhero with Maggie as her sidekick, while Bart puts a jug on his head with the pretense of it being the helmet of an alien warlord. However, his head accidentally plops into it and the jug is left stuck on his head. Lisa "frees" Bart from the jug using a croquet mallet. 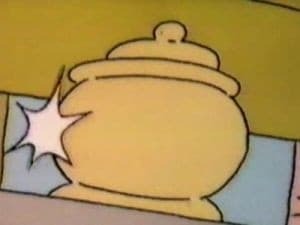 Lisa and Maggie then hide, allowing Bart, stumbling in a daze amongst pieces of the precious broken jug lying on the floor, to take the blame. 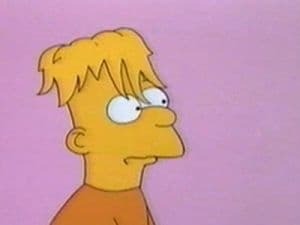 Bart has his hair cut too short by a barber. 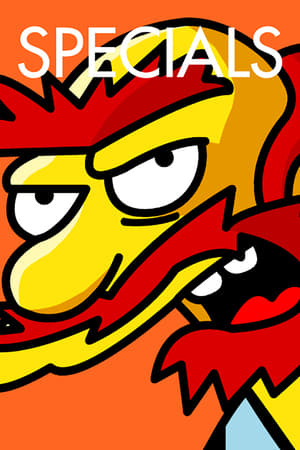 This is the first time we hear a character from The Simpsons series say a curse word. 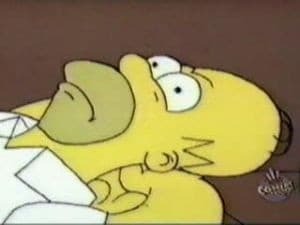 Homer wakes up the family to practice for a nuclear drill... in the middle of the night. 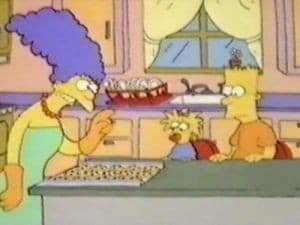 Marge bakes a batch of delicious cookies. Bart attempts to steal them, but burns his fingers trying to pick them up. 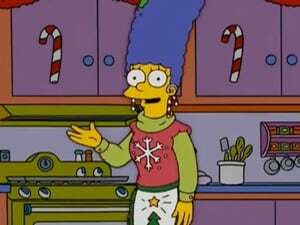 Everyone except Bart and Maggie leave the kitchen to let them cool down, and Bart takes this opportunity to swipe them, muttering to himself "Aha! The perfect crime!" 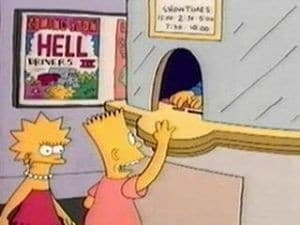 Homer and Marge come back to find the tray empty. Marge suspects Maggie of eating the cookies, but as a witness she knows exactly who took them and guides them along a trail of cookies running across the floor. His family catch him lying on his back in his bedroom amidst a pile of cookie crumbs. Looking up at them with his stomach full, he groans, "There is no perfect crime." His head bangs back down on the ground and Maggie, secretively, snacks on an uneaten cookie. 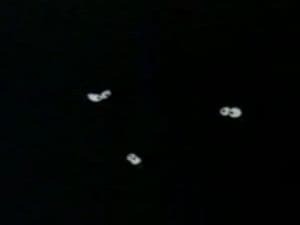 Bart tells Lisa & Maggie a series of scary stories (in the middle of the dark) only to believe they're coming true. 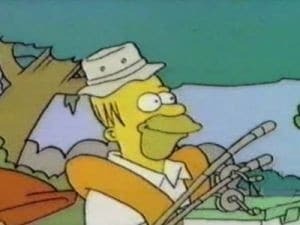 Bart and Homer go on a fishing trip. 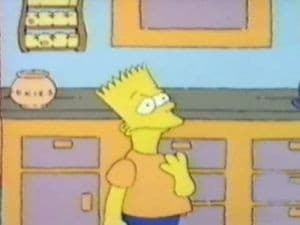 Homer asks Bart for a bologna sandwich, but Bart forgot the bologna. He puts the bait on the sandwich instead. Later on they hit rapids and Homer is almost knocked unconscious. They later fall off of a waterfall. 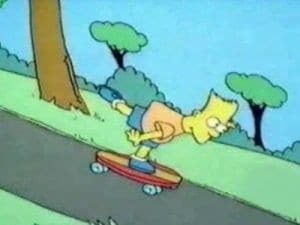 Bart teaches his sisters how to skateboard...or is it the other way around. The kids discuss paganism. 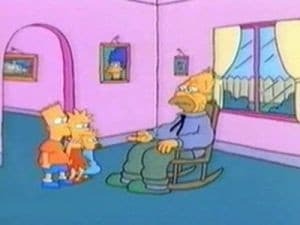 This is the first time Bart calls his dad "Homer". 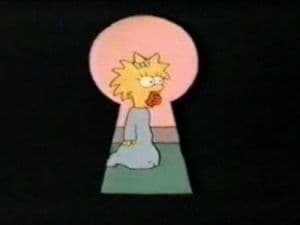 Bart locks himself in the closet, and when he busts out, he finds out that the family has gone out without him. 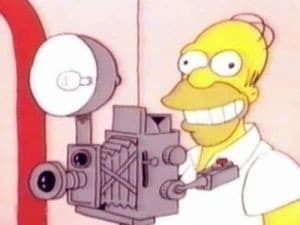 Homer has trouble taking a normal family portrait. 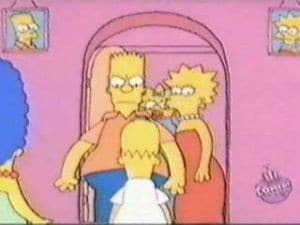 Lisa and Maggie try to cure Bart's hiccups...the hard way. 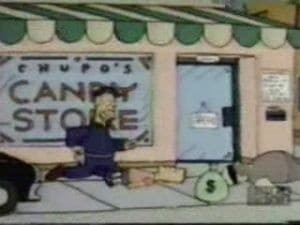 The kids try to steal money from Marge's money jar.. 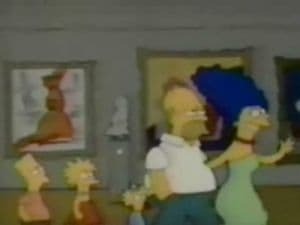 The Simpsons go to the art museum. 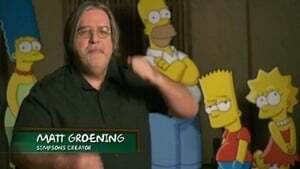 This is the first time we hear Bart say "Whoooa, Mama!". Homer unwisely teases a monkey at the zoo and gets a faceful of poo for his trouble. 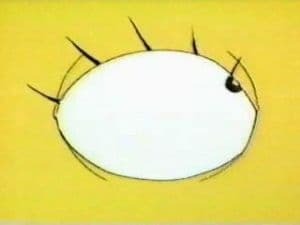 This is the shortest Simpsons Short. Maggie squeaks her toy, causing a chain reaction of anger in the family. 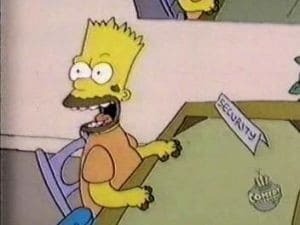 Bart tries to hide the cookies he stole from the jar from his parents. 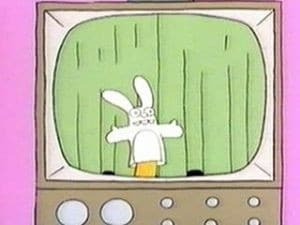 Bart puts on his own show after Homer tells him to stop watching cartoons. First appearance of Itchy and Scratchy. This is the first time we hear Lisa call her dad "Homer". Bart, Lisa and eventually Marge take out their frustrations on a punching bag with Homer's picture on it. 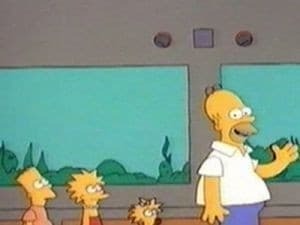 The kids get to see Krusty's show live for the first time. 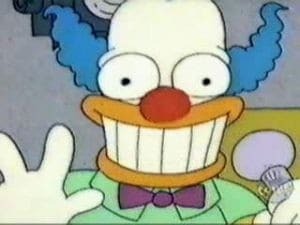 First appearance of Krusty the Clown. Sent out to exercise, Bart foils a robbery attempt. 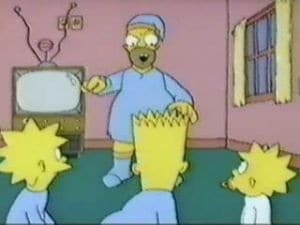 Bart tells a story about large kids who throw their small parents into a small room. 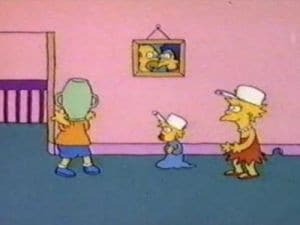 Bart, Lisa and Maggie go to the movie to see "The Happy Little Elves Return" (much to Bart's dismay), but Bart convinces the girls to see "Space Mutants" instead. Guess who's the scaredy-cat! 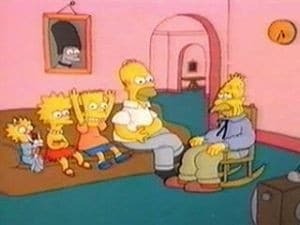 Homer tries hypnosis to calm down his crazy kids. Bart's attempt to swipe some chocolate is foiled. The family drives to Echo Canyon, takes turns making echoes, and Bart almost makes a boulder crunch the family car. 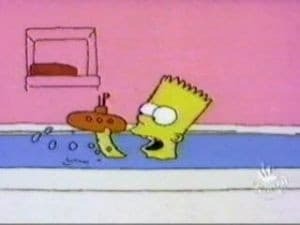 Homer makes Bart take his "Sunday Night Bath", only to flood the bathroom. this is the last Simpsons short in which we see a naked Simpsons character. 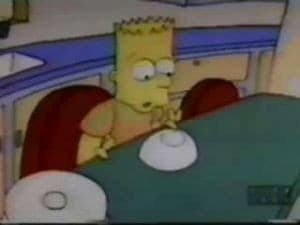 In this sequel to "Shell Game", Bart has a nightmare after eating every single cookie from the cookie jar. 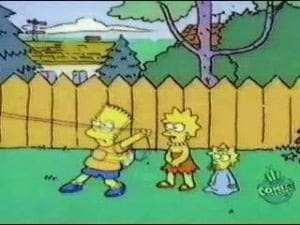 The kids swing from the trees off Homer's ties. Part 2. Maggie floats in the air hanging on to balloons and lands safely back in her playpen. 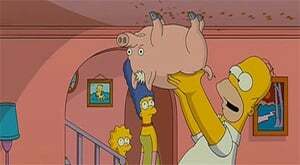 Homer attempts to fix the television antenna on the roof. 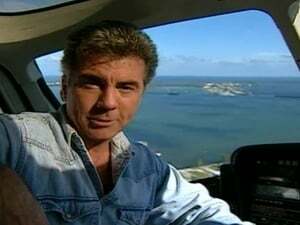 This special was aired before the premier of the 7th season opener; hosted by John Walsh (from the FOX series "Americas Most Wanted"), it offered up all sorts of theories and insights into who might have shot Montgomery Burns. 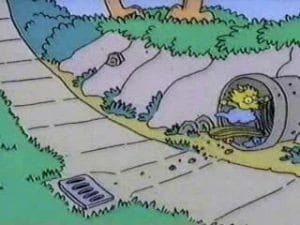 After Homer accidentally pollutes the town's water supply, Springfield is encased in a gigantic dome by the EPA and the Simpsons family are declared fugitives. Marge comments on David and Victoria Beckham's marriage in a negative comparison with hers and Homer's, and compared the special relationship between the UK and the US to that of Mini Me and Dr. Evil in the Austin Powers films ("Helping out in all our zany schemes to take over the world"). Lisa Simpson also held a banner supporting Cornwall's secession: "UK OUT OF CORNWALL", while chanting "Rydhsys rag Kernow lemmyn" (freedom for Cornwall now). After getting lost in a game of hide-and-seek, Lisa wanders into the field and discovers three teenage girls who are practising Wiccans. Though she is sceptical of their spells, the girls assure Lisa that they never hurt anyone and ask her to join their coven. Just before Lisa is inducted into their pact, Chief Wiggum arrives and arrests the three girls for witchcraft and Lisa becomes the star witness in the trial. In the first of Sky One's specials celebrating 20 years of "The Simpsons", Ricky Gervais takes you behind the scenes to see how the show is made, talking to those who put each episode together, plus celebrity fans like Simon Cowell and Hugh Hefner. 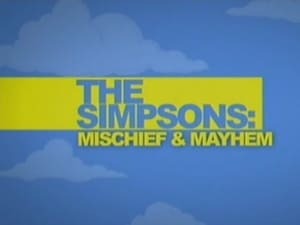 In the second of Sky One's specials celebrating 20 years of "The Simpsons", Ricky Gervais takes a look at the vast array of Simpsons merchandise the colourful characters have inspired and catches up with some of the programme's biggest devotees. 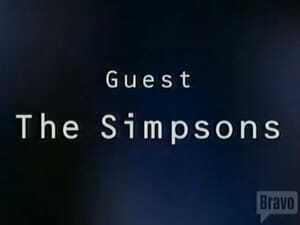 In the third of Sky One's specials celebrating 20 years of "The Simpsons", Ricky Gervais speaks to a selection of the huge number of celebrities who have guest-starred on the show over the years. The youngest member of the Simpson family has a big adventure at the 'Ayn Rand School for Tots' in this Oscar-nominated animated short film.